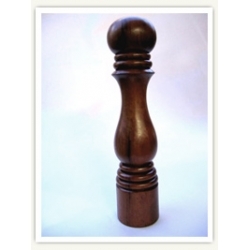 They are a sensational grinder, suitable for Salt, Pepper, Coffee and many spices. They have an easily accessible adjustment wheel to set the grain size and are used within many high quality brands within the world. The Crusgrind 260 mechanism is suitable to make mills of 12-30cm in height, while the Crushgrind 500 is suitable to make mills from 12-60cm in height. The Crushgrind Wood mechanism is suitable for smaller grinders, whose height is not determined by any mechanism dimension. All are now readily available. The internal mechanism has been recently redesigned and released as "Crushgrind Diamond". The main difference is the removal of the ratchet mechanism after a series of failures.